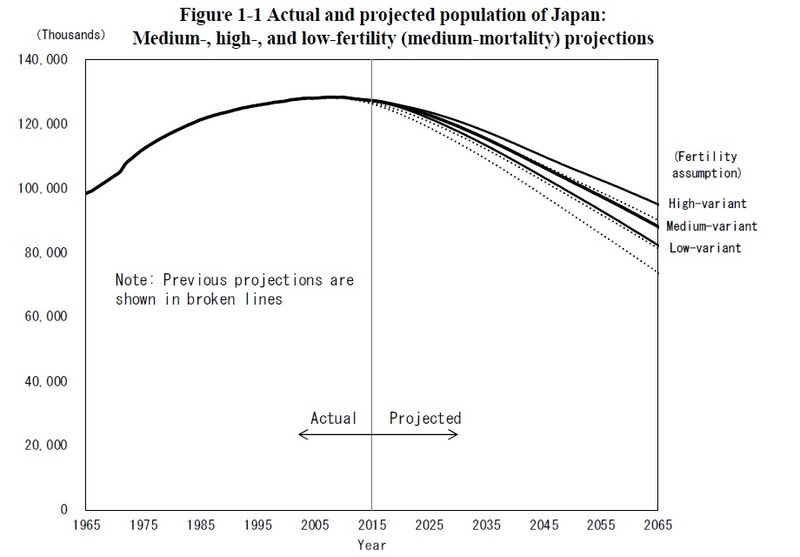 The report notes that the 2015 Census gives a total Japanese population of 127 million in 2015, which in a middle-variant prediction will fall to 88 million--a fall of roughly one-third--in the next 50 years. 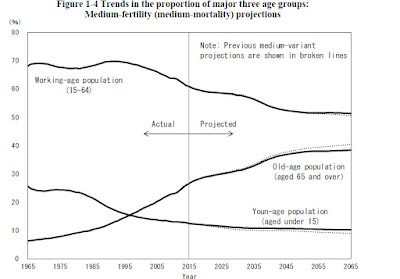 Here's a breakdown for what share of the population will be over 65, under 15, and in-between. 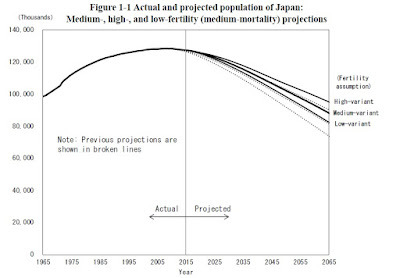 The working-age share of Japan's population was about 66% in the 1970s and 1980s, but is now down to 60%, and the long-term projections suggest that it will fall to about 50% in the next 30 years. 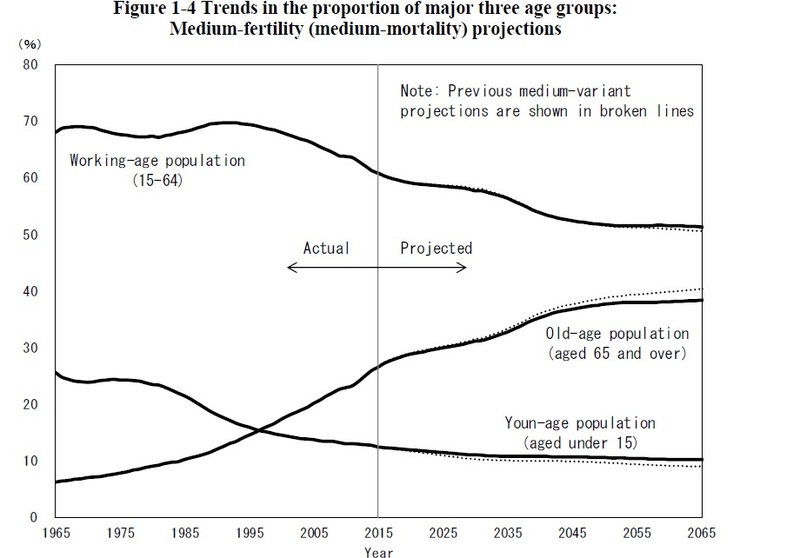 Aging and lower birthrates have been happening all over the world, but Japan is an extreme case. Two articles recently caught my eye about a couple of the many adjustments that Japan's economy will need to make in the years to come. One adjustment is "financial gerontology," which is the study and policy related to how older folks will manage their money--especially in cases of Alzheimer's or other kinds of diminished capacity. "[F]inancial gerontology ... refers to a policy area that seeks to address the question of how to ensure proper management of assets owned by elderly people with dementia or other problems in making decisions to support their livelihoods, while at the same time maintaining the vitality of the Japanese economy as a whole. Elderly people aged 65 and over, totaling some 30 million at present, own more than half of the 1.8 quadrillion yen worth financial assets held by Japanese households. Approximately five million of them are suffering dementia. The number is expected to rise to seven million in 2030, meaning that well more than 100 trillion yen worth of assets will be owned by those with senile dementia. "At present, most of those assets are held in cash. Reportedly, significant amounts of assets are left dormant—rather than invested in equity securities—because self-imposed industry regulations prohibit securities firms from recommending elderly customers to make new investments. The guardianship system for adults, which was established under the jurisdiction of the Ministry of Justice exclusively for the purpose of ensuring the proper management of property owned by elderly people with dementia, reportedly allows investments only in the form of principal-protected cash equivalent assets such as bank deposits because family courts tend to operate the system conservatively. "It might be too much to ask family courts, which have no economic expertise, to have a mindset to increase returns by taking appropriate risks. However, guardians would be doing no good for their wards as well as for Japan unless they take some risks in balance with returns. Performing the task of guardians, which is to manage property, needs sufficient economic knowledge and a way of thinking. It was probably wrong to have designed the system originally in a way to leave the entire task to the legal community. Also, it is often pointed out that guardians often lack coordination with caregivers and welfare specialists in undertaking their activities despite the fact that their task is to look after elderly people with dementia. It takes a broad spectrum of cooperation encompassing not only the legal, financial, and economic communities but also professionals specialized in elderly welfare to ensure the proper management of property owned by elderly people. However, a system for such cross-sectoral cooperation is hardly in place." To me, this insight suggests that one reason why Japan can continue to run enormous budget deficits is that Japan's elderly own a large amount of wealth, which often ends up in very safe assets. Japan's economy would plausibly be better off if some of these funds ended up in well-diversified investments in private sector firms. 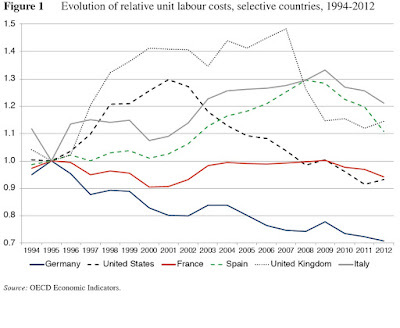 "[T]he gap in productivity growth between the manufacturing and services sectors in Japan is extremely wide. While there are many causes, the largest gains in industrial productivity have been closely correlated with increased use of information and communication technology and automation. Perhaps it is no coincidence that the most productive manufacturing sectors in Japan—automotive and electronics—are the ones whose production processes are heavily reliant on automation. By contrast, the services sector, which accounts for 75 percent of GDP, has seen little annual productivity growth—only about half that of the United States. Labor productivity has roughly tripled since 1970 in manufacturing, but improved by only about 25 percent in the nonmanufacturing sector. "Surveys support the view that both the volume and quality of services in Japan are in decline. 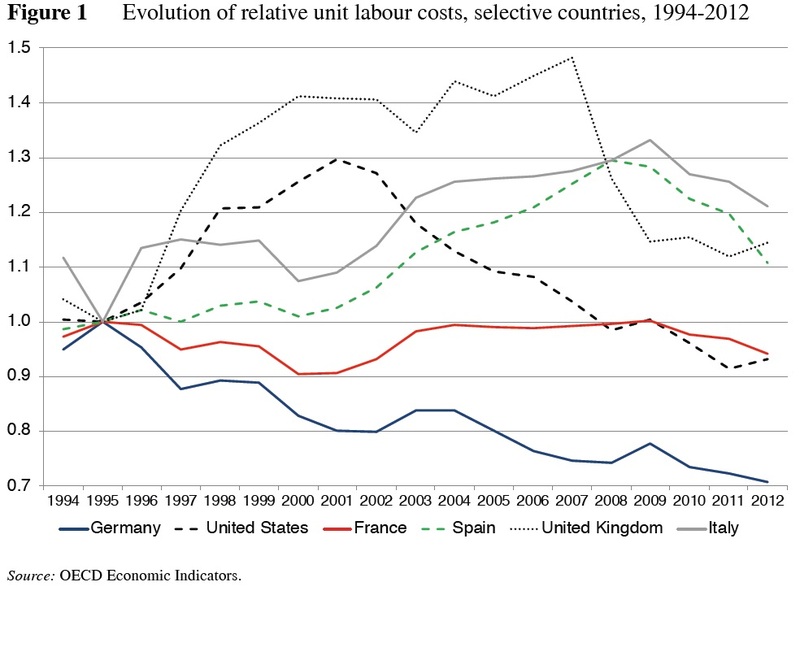 Recent work by the research arm of Japan’s Research Institute of Economy, Trade and Industry (Morikawa 2018) shows that the quality of services is eroding as a result of labor shortages. Most critically affected are parcel delivery services, hospitals, restaurants, elementary and high schools, convenience stores, and government services." Japan's prospects for future economic growth seem likely to be intertwined with how the country can mobilize the enormous savings of its elderly to focus on the wave of robotic and AI technology that will be needed to complement its shrinking workforce. Many of the public policy disputes over education, whether at the K-12 level or at the higher education level, quickly turn into disputes over how much to spent, or whether "enough" is being spent. For some international perspective on these issues, the Condition of Education 2018 has just been published by the National Center for Education Statistics (May 2018). It's chock-full of useful tables and figures, but here are a few from the "International Comparisons" part of the volume. 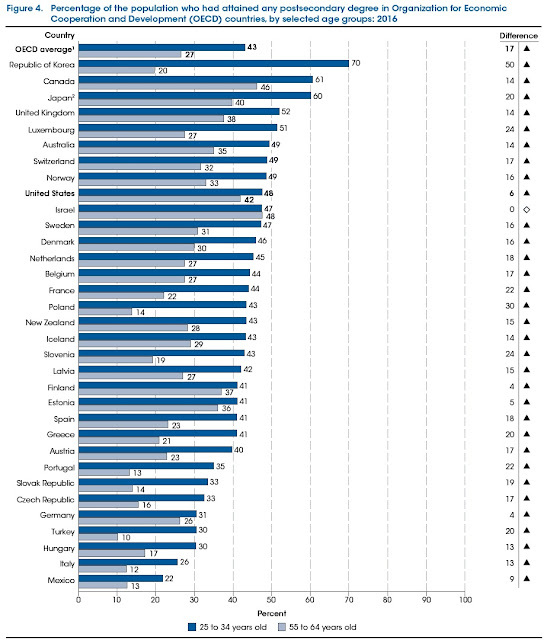 First, look at spending per student in OECD countries, as compared with per capita GDP. 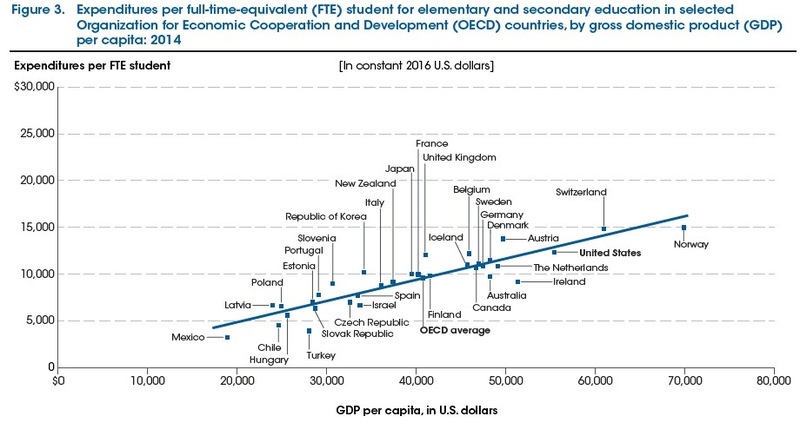 As the figure shows, the relationship is pretty much a straight line, in which countries with higher per capita GDP spend more on K-12 education. This makes some intuitive sense, given that teachers are one of the main expenses in any K-12 system, and when a country has higher capita GDP, wages in general and pay for teachers in particular will be higher, too. The figure shows that while a few countries spend a little less than one might expect on K-12 education based on their per capita GDP (Mexico, Ireland) and some spend a little more (Korea, United Kingdom), most countries are quite close to the predicted line, like the United States. Of course, this doesn't prove whether the US should dramatically change its level of K-12 education spending. 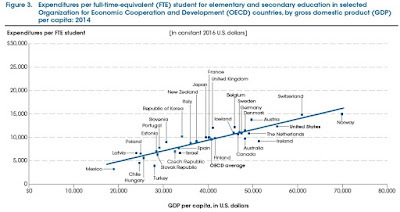 But it suggests that US K-12 spending is not out-of-line with the rest of the world in this area. What does a similar figure look like for higher education spending? Some interesting patterns emerge. For example, Mexico spent less on K-12 than one would predict from per capita GDP, but spends more on higher education. Conversely, Korea spent more on K-12 than one would predict based on per capita GDP, but spends less on higher ed. The United States spend way more than any other country on higher education on a per capita basis, and way more than would be predicted based on per capita GDP. Of course, this doesn't prove whether the US should dramatically change its level of higher education spending, or how US higher education is delivered. 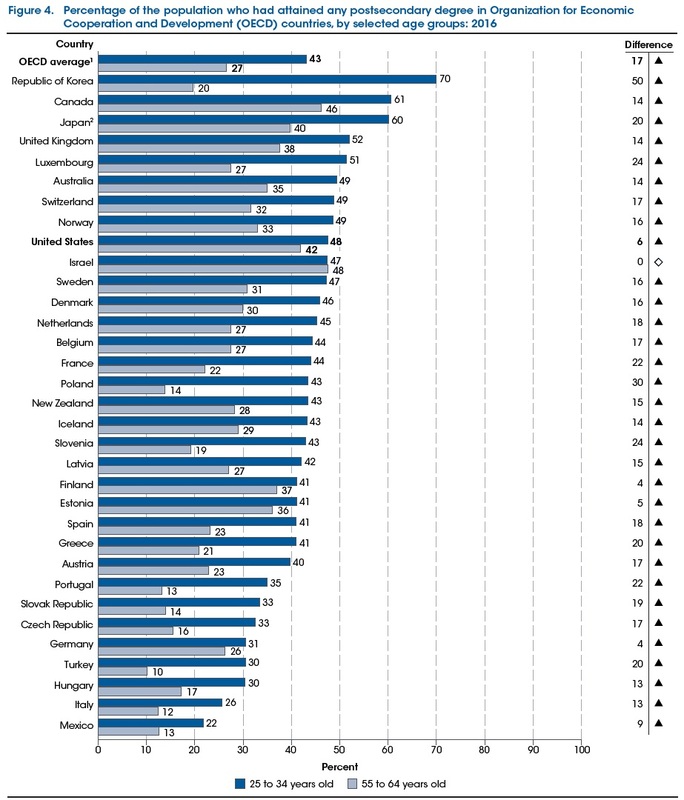 But it suggests that the US higher education experience is different from most of the rest of the world. Here's one more comparison, looking at the share of adults who have a postsecondary degree of some kind. In the figure, the light blue bars show the share in the 55-64 age bracket who have such a degree, while the dark blue bars show the share in the 25-34 age bracket with such a degree. One would generally expect that as higher education expands, a larger share of those in the younger group should have postsecondary degrees, compared with those in the older group, and this pattern holds for most countries. But notice that for the US, the age 55-64 group was in general more educated than the rest of the world, with the exception of Canada. 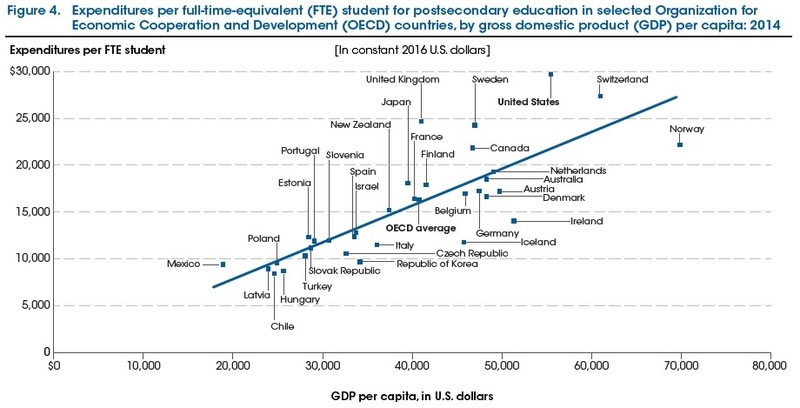 But for the 25-34 group, the US is still above the OECD average in share with a postsecondary degree, but a number of other countries are now substantially ahead, and the US is much more middle-of-the-pack. When combined with the previous figure, this makes some sense. Given that the US spends vastly more on a per person basis for higher education, it's more costly for the US to provide a big expansion of higher education for the young adults of today. Here's a nice question to kick around the classroom or the lunch-table: "If we pay football players, why not kidney donors?" Philip J. Cook and Kimberly D. Krawiec argue that both should be paid in Regulation magazine (Spring 2018, pp. 12-17). "Although living kidney donation is a common medical procedure and donors usually enjoy a full recovery, the loss of a kidney poses long-term health risks, in particular that of renal failure if the donor’s remaining kidney fails. In the United States and most every other country (with the notable exception of Iran), kidney donation is permitted but financial compensation for donors is prohibited. Not only is there no legal market for kidneys, donors in the United States are often not even reimbursed for their full out-of-pocket cost in making the donation. "The ban on compensation may protect potential donors from the temptation of easing their financial situation by giving up a kidney, a choice they may regret in later years. But this regulation has dire consequences. "While the recent evidence on the long-term medical damage from concussion has caused widespread concern, there is no prominent voice calling for a ban on professional football. Indeed, a ban is unthinkable in the foreseeable future. That observation helps illustrate the importance of history, custom, and established interests in shaping the debate over regulating risky activity. But if we could start fresh, the current configuration of activities for which compensation is banned would seem very odd. "If ethical concerns persuade thoughtful people that the “right” answer is to ban compensation for kidney donation, then the same logic would suggest that compensation should also be banned for participation in violent sports. If the “right” answer is to permit compensation for participation in violent sports, then compensation for kidney donation should also be permitted. We see no logical basis for the current combination of banning compensation for kidney donors while allowing compensation for football players and boxers." Like a lot of useful analogies, the value of this question isn't to parse details about whether football and kidney donations are literally identical, but to use the question to explore attitudes about bodily risk, benefits, and monetary payments. Cook and Krawiec also point out that annual revenues for the National Football League are about $13 billion, while one cost-benefit study of paying for kidney donation suggests that such a policy could save taxpayers about $12 billion per year in expenses for people with kidney disease awaiting a donation, in addition to saving thousands of lives and improving the quality of life for tens of thousands of those with severe kidney disease. Those over age 65 have health insurance through Medicare. 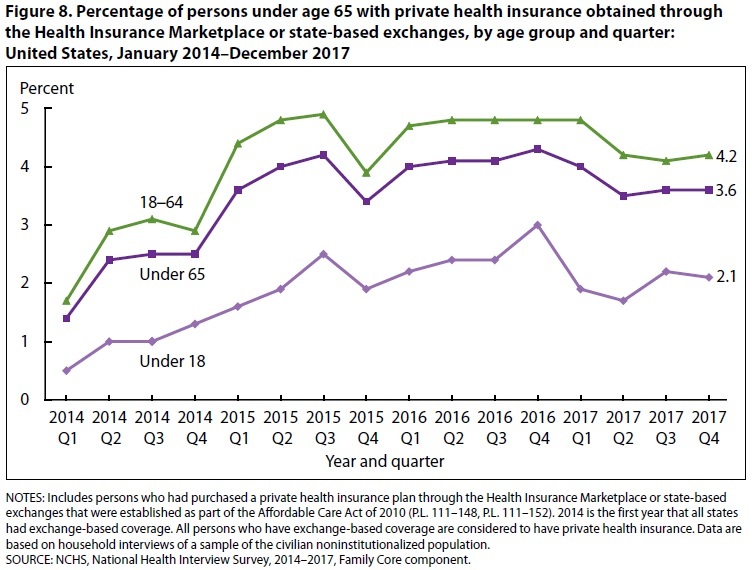 Thus, it's conventional to focus on the health insurance status of those the age 64 and below The percentage of adults age 18-64 without health insurance drops sharply right after the passage of the 2010 legislation, and has stayed lower since then. For those under age 18, two patterns are readily apparent. 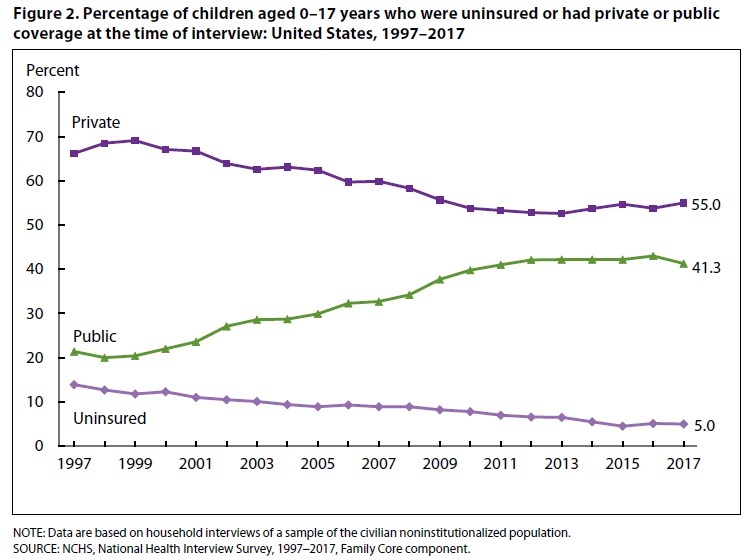 The percentage of insured children has been falling steadily since 1997, tracing back to the passage of the State Children's Health Insurance Program (SCHIP) that year. 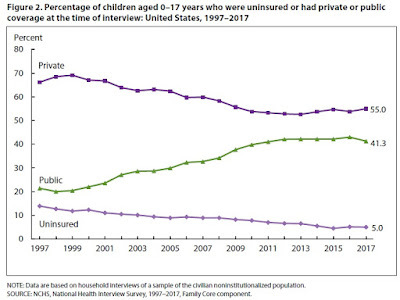 At the same time, the share of children with private health insurance coverage has steadily declined, and the share with public coverage has risen. These long-term patterns are not much altered by the 2010 legislation. 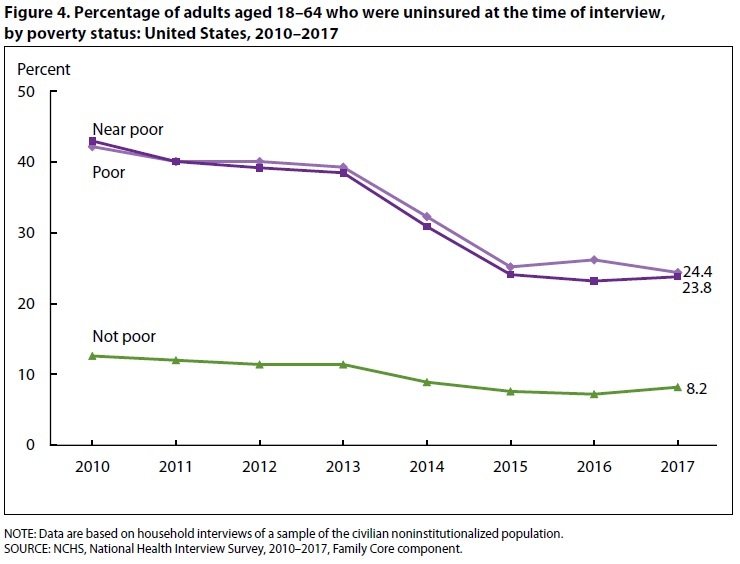 Those who were poor and near-poor were most likely to see expanded health insurance coverage as a result of the 2010 legislation. 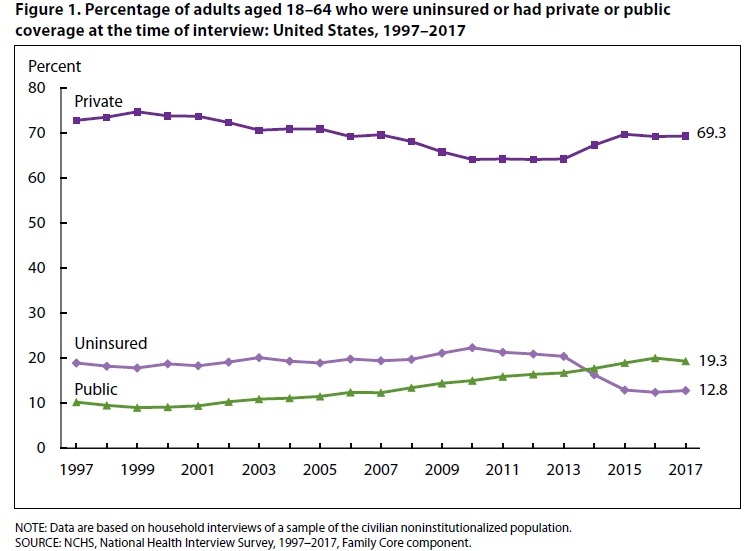 The first figure above shows that the share of those on public health insurance rises, like expanded Medicaid programs. 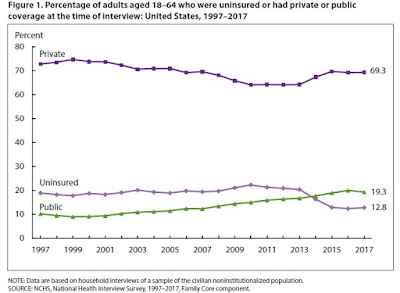 The share of those having private insurance rises, too. 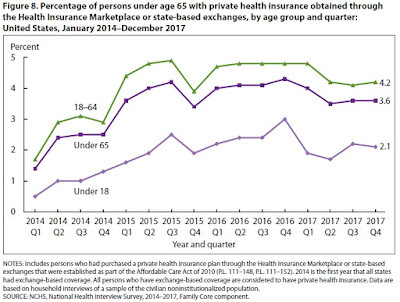 However, those who purchase health insurance through the "exchanges" are counted in these statistics as having having private health insurance. This accounts for about 4 percentage points of the overall rise in health insurance coverage. 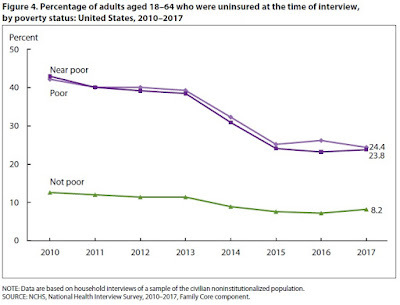 The benefits that the Affordable Care Act was likely to achieve in terms of expanding health insurance coverage were often oversold. If you read the fine print, even well before passage of the law, it was never projected to provide universal health insurance. It's also fair to note that the costs were often undersold. Unless you browse through Congressional Budget Office documents, you may not know that the expansion of health insurance coverage is costing about $110 billion annually. As I've written before, there's no magic here. It was never any secret that if the federal government was willing to spend an additional $110 billion, it could expand health insurance coverage to an additional 20 million people. The cost for the expanded health insurance coverage works out to about $5500 per person per year. Personally, I'm fine with spending the money for this expansion of health insurance coverage, although I would have preferred to see the money raised by taxing some portion of employer-provided health insurance benefits as income. "Teachers are leaving their jobs for other careers at a rate that has grown steadily every year in the past three years. ... The majority of educators leaving Educational Services (NAICS Sector 61) are starting careers in the Healthcare and Social Assistance sector. ... For starters, some jobs in Healthcare and Social Assistance, which includes nurses, child care and family assistance services, often require some of the same skills. “Administrative Services,” which includes office workers, is another category that attracts many educators leaving the workforce. Moves to these industries are not surprising since they are two of the largest sectors of the economy. ... 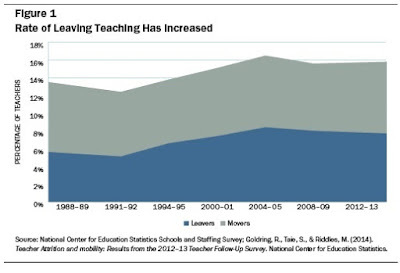 Educators aged 25-34 are the largest cohort of job-to-job movers." "The percentage of teachers leaving the profession—known as “leavers”—has increased substantially over the past two decades: 5.1% of public school teachers left the workforce in 1992, while 8.4% left in 2005. Attrition rates have continued to hover around 8% since then (see Figure 1).The 3% increase in attrition rates is not trivial: It amounts to about 90,000 additional teachers needing to be hired across the U.S. each year. In high-achieving school systems such as those in Finland, Singapore, and Ontario, Canada, annual teacher attrition rates typically average as low as 3% to 4%. If attrition rates in the U.S. could be reduced by half to be more comparable with these systems, the national teacher shortage could be virtually eliminated." About 90% of the nationwide annual demand for teachers is created when teachers leave the profession, with two-thirds of teachers leaving for reasons other than retirement. If school systems can address the factors that create high turnover, they can reduce the demand for teachers who are in short supply. Total turnover rates are highest in the South (16.7%) and lowest in the Northeast (10.3%), where states tend to offer higher pay, support smaller class sizes, and make greater investments in education. Teachers of mathematics, science, special education, English language development, and foreign languages are more likely to leave their school or the profession than those in other fields. These are teaching fields that experience shortages in most states across the country. Turnover rates are 50% higher for teachers in Title I schools, which serve more low-income students. Mathematics and science teacher turnover rates are nearly 70% greater in Title I schools than in non-Title I schools, and turnover rates for alternatively certified teachers are more than 80% higher. Turnover rates are 70% higher for teachers in schools serving the largest concentrations of students of color. These schools are staffed by teachers who have fewer years of experience and, often, significantly less training to teach. Teacher turnover rates are 90% higher in the top quartile of schools serving students of color than in the bottom quartile for mathematics and science teachers, 80% higher for special education teachers, and 150% higher for alternatively certified teachers. Teachers of color—who disproportionately teach in high-minority, low-income schools and who are also significantly more likely to enter teaching without having completed their training—have higher turnover rates than White teachers overall (about 19% versus about 15%). While they leave at higher rates than White teachers generally, their turnover rates are about the same as those of all other teachers in high-poverty and high-minority schools. Teachers cite a number of reasons for leaving their school or the profession. The most frequently cited reasons in 2012–13 were dissatisfactions with testing and accountability pressures (listed by 25% of those who left the profession); lack of administrative support; dissatisfactions with the teaching career, including lack of opportunities for advancement; and dissatisfaction with working conditions. These kinds of dissatisfactions were noted by 55% of those who left the profession and 66% of those who left their school to go to another school. The authors offer a number of sensible suggestions for retaining teachers along the lines of higher pay, better administrative support and working conditions, and so on. I don't disagree. But it also seem to me that those low-performing schools which also serve high share of low-income students may in some cases need a bigger and perhaps even jolting set of changes, perhaps drawing on lessons about approaches to curriculum and teaching, along with intensive tutoring, used at successful charter schools. Could vaping and e-cigarettes reduce the toll of death and illness due to smoking conventional cigarettes? The most recent issue of the Annual Review of Public Health (April 2018) has a nice pro-and-con. On one side, David B. Abrams, Allison M. Glasser, Jennifer L. Pearson, Andrea C. Villanti, Lauren K. Collins, and Raymond S. Niaura have written "A Harm Minimization and Tobacco Control: Reframing Societal Views of Nicotine Use to Rapidly Save Lives" (pp. 193-213). They argue that e-cigarettes can be a useful part of a harm minimization strategy. On the other side, Stanton A. Glantz and David W. Bareham offer a more skeptical view about whether e-cigs will reduce the overall harms from tobacco use in "E-Cigarettes: Use, Effects on Smoking, Risks, and Policy Implications (pp. 215-235). There's a readable short summary/overview of these two articles in the Knowable magazine (which summarizes results of articles that appear in the Annual Review journals). Viviane Callier has written "E-cigarettes: A win or loss for public health?," subtitled, "They’re less toxic than traditional cigarettes but still addictive and not without their own health risks. Researchers disagree on whether vaping can help or harm efforts to reduce tobacco use" (May 11, 2018). As she notes: "In 2006, e-cigarettes were introduced in Europe and the US. Uptake has been rapid among adults and youth alike. According to the Centers for Disease Control and Prevention, in 2016, more than 2 million US middle and high school students had used e-cigarettes in a 30-day period, and 3.2 percent of US adults (approximately 10.4 million) were current users." "Inhalation of the toxic smoke produced by combusting tobacco products, primarily cigarettes, is the overwhelming cause of tobacco-related disease and death in the United States and globally. A diverse class of alternative nicotine delivery systems (ANDS) has recently been developed that do not combust tobacco and are substantially less harmful than cigarettes. ANDS have the potential to disrupt the 120-year dominance of the cigarette and challenge the field on how the tobacco pandemic could be reversed if nicotine is decoupled from lethal inhaled smoke. ANDS may provide a means to compete with, and even replace, combusted cigarette use, saving more lives more rapidly than previously possible. ... A reframing of societal nicotine use through the lens of harm minimization is an extraordinary opportunity to enhance the impact of tobacco control efforts." Here's a figure from their paper showing how they perceive the harms from e-cigarettes: that is, similar to other aids to quitting smoking like nicotine patches or nasal sprays, clearly lower than smokeless tobacco, and dramatically lower than combusted tobacco. Here's a figure from their paper showing patterns of teens and e-cigarettes. Notice that conventional smoking has dropped faster than expected since the arrival of vaping, but the overall downward trend--combining smoking and vaping--maybe altering. "Survey data from the charity ASH (Action on Smoking and Health) indicates that the vast majority of e-cigarette users in the UK are either ex-smokers or current smokers,5 and regular use among ‘never smokers’ remains very low, at less than one per cent.3,5 The level of e-cigarette use by children also remains low ..."
"Significant numbers of smokers are now using e-cigarettes in attempts to stop smoking. The most recent data from the smoking toolkit study indicates that 34% of people trying to stop smoking use an e-cigarette, and e-cigarettes are the most popular device used in attempts to quit smoking. ... Overall – while there is a lack of high-quality research into their effectiveness as a cessation aid – most reported studies demonstrate a positive relationship between e-cigarette use and smoking cessation." It's hard for an outsider like me, without training in medicine and epidemiology, to evaluate these controversies. On one side, there is a danger that vaping could lead to an increase in tobacco use, and to health harms that are not yet understood. On the other hand, there is a danger that sharp restrictions on vaping would lead more people to continue with conventional cigarettes, with health harms that are very well understood. For what it's worth, my reading of the evidence comes down somewhat in favor of a belief that vaping will disrupt the cigarette industry, and that the probabilities are in favor of believing that this change will benefit public health. To put it another way, efforts to treat vaping as if it is fully equivalent to conventional cigarettes run a real risk of costing lives. Sheila Dow discusses pluralism in economics. "One example would be that New Keynesians focus on market imperfections and that provides the justification for intervention. But the implication is that without those imperfections we would be in the perfect general equilibrium world and intervention wouldn’t be required. So, it’s great that they are focusing on limitations of markets and therefore proposing policies which often would be supported by Post-Keynesians. But Post-Keynesians would approach the question very differently; the rationale for intervention, and the starting point in other words would not be an ideal general equilibrium world. This is difficult to talk about because the differences are so profound. A Post-Keynesian would start with a historical understanding of a particular context, not seek a universal solution; understand ways in which the market economy does not ensure full employment (the principle of effective demand is a core principle within the Post-Keynesian approach); look at the role of money; look at the way in which financial markets create instability and through financial instability create economic and monetary instability." Geoffrey Harcourt discusses his views on Keynesian and Post-Keynesian economics. "But as far as positive attributes [of Post-Keynesian economics] are concerned, the way of defining particular functions, like the consumption function, the investment function, putting in how you model exports, how you model the demand for imports, how you model the government's behaviour, they are all peculiarly post-Keynesian because they are based on observations rather than on axiomatic assumptions." "If there had been greater reliance on history, I think there would have been a greater appreciation that a combination of a housing boom and credit expansion was highly dangerous. What happened, to a degree, was that in the US there were wonderful data on housing – all aspects of the housing market – which went back to the early 1950s. For 50 years you had monthly data on housing prices and all that. During these 50 years, if you held a diversified portfolio of houses across all the States in the US, there was only I think one or two quarters where housing prices overall on average fell. There were crises in New England at one stage and then the oil-producing states at another, but if you diversified you seemed to be safe. "If you took these 50 years, and ignored history elsewhere, and you ran your econometric analysis and assumed that the future was going to be like the past of those 50 years, it actually came about that you reckoned that a decline in housing prices over the whole of the United States of more than about four or five percent was an almost unimaginable event. It was basically on that premise that people went into, for example, all the sub-prime stuff, because it didn't matter if you were lending to poor people or people who are likely to get ill, who were on the fringes of the labour market and so on, because if they couldn’t repay you, for one reason or another, if housing prices didn't go down you could foreclose and you would still be safe, because you wouldn't lose any money, whereas you could sell. 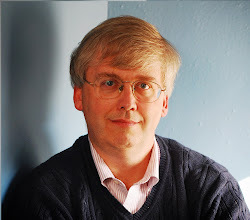 Tony Lawson argues against the mainstream use of mathematical methods in economics, and instead advocates an ontological approach. "The mainstream is defined in principle by an emphasis on applying a narrow set of methods, those of mathematical modelling, whatever the context. In accepting this principle its advocates are forced into working with a particular ontology, whether they recognise it or not: to presupposing worlds of isolated atoms. Thereafter they are reduced to focusing on theories, or formulations of theories, that can be transformed into the world of isolated atoms. In essence, human beings have to be turned into atoms. The obvious assumption to use in order to effect this is that we humans are all super-rational; we don't make mistakes. Situations are devised wherein, relative to the notion of rationality specified, there is a unique optimum, and the presumption is that any model agents, being rational, would ‘end up’ there. "My assessment is that most heterodox groups are each best identified or distinguished through a tradition-specific focus on issues that fairly clearly reflect ontological presuppositions and concerns, and indeed a shared set. Institutionalists, following Veblen, are very interested in both evolutionary change, and things like institutions that bring stability within change. So, in evolutionary economics a focus on process and stability is fundamental. Post-Keynesians are very interested in uncertainty. Uncertainty basically derives from the openness of social reality. So, it’s an ontological presupposition of openness that conditions their focus. Feminists are especially interested, I believe, in relationships. Relations of care, oppression, exploitation, etc. It is an ontological orientation of relationality that is fundamental here. Marxian economists focus on the relational totality in motion that is capitalism. So, ontological categories like relationality, openness, process, totalities are key to identifying the various heterodox traditions. "I believe the just noted ontological categories are everywhere relevant, each being fundamental features of all social phenomena. So, I see the separate heterodox traditions each as a division of labour looking at the same basic social reality from a particular perspective. Implicitly at least, they agree more or less on the nature of social reality, and are divisions of labour within the study of it." Julie Nelson is interviewed on the subject of feminist economics, which she once defined as "work having to do with the economic roles of men of women that has a liberatory bent ... and work on the definition and methodology of economics that shows the gender biases there." "I think of the feminist analysis as a particular way in ... The gender aspect, along with explanations coming from economic power and class, I think, together explain a lot of the power of the mainstream in economics. That is, the mainstream is supported in part because it kind of throws a smokescreen over inequalities which we would rather not look at. For example, in the US, these ridiculous CEO salaries, some people spout a free market sort of thing to justify that. But then also I think there is a psychological dimension to the power of the mainstream. It seems to be more macho, more rigorous, somehow more scientific, and builds this big barrier of math: ‘Well, you don’t understand the policy because you can’t read this journal article’. I think this is rather silly and that the more we reveal that the emperor has no clothes, maybe, the easier it will be to knock down." Ha-Joon Chang discusses the development economics, contrasting the neoclassical view with a productivist view. "People have debated about the definition [of development economics] for ages. Now, broadly, there are, I think, two-and-a-half definitions, if I may say so. The first definition is basically conflating economic development with economic growth. So as output per capita grows, there is economic development. This view is adopted by most neoclassical economists, who form the vast majority of the economic profession today. But then there is another definition, which has roots from the classical school and the Marxist school and also what I call the developmentalist tradition, people like Alexander Hamilton, Friedrich List, and the development economists of the 1950s and ‘60s, people like Simon Kuznets, Albert Hirschman and so on. In these alternative traditions, economic development is defined not purely in terms of quantitative growth but qualitative change. "It is not just academic theoretical differences because they give very different policy implications. So if you take what I call the productivist view, the view that economic development is in the transformation of the productive sphere, yes, then you will necessarily recommend economic policies that will encourage the accumulation of new technologies, acquisition of new skills by workers, transformation of the social arrangements to back those. So the most famous policy recommendation in this tradition is the so-called infant industry argument. The argument that governments of economically-backward nations need to provide trade protectionism, subsidies and other supports to young industries so that they can have the space to develop their productive capabilities and eventually catch up with the more advanced producers from abroad. Now, for this to happen, you would need to provide tariff protection. You might even need to ban the imports of certain foreign products. You might put restrictions on foreign direct investment. You might set up state-owned enterprises in the large capital-intensive sectors with high risk because, typically, in developing countries, there are no large capitalists that can take such risks in the beginning. So you recommend these kinds of policies. "If you took the neoclassical view, then, basically, economic growth happens ultimately as a consequence of people trading. So as people want to buy better things then they are ready to offer higher prices and entrepreneurs will spot the opportunity, produce new things. In that world, you also assume that technologies are freely available, and therefore everyone has equal productive capability. ...At most, you would provide some public goods like infrastructure and basic education, but, beyond that, you don't really have to do anything other than keeping competition alive by opening your borders, by deregulating businesses. ... If you keep the markets open and free, economic development naturally follows. I studied economics in the early 1980s in South Korea. Most of our professors were neoclassical economists, although, compared to today’s neoclassical economists, they were much milder. But the reason why I started looking at other approaches was because I just couldn't reconcile what I was taught in the classroom with what was happening around me. At the time, South Korea was going through its miracle growth period. The economy was growing at 8, 10, 12% every year, massive social transformation, positive and negative, and huge conflicts. Workers going on strike, students going on demonstration, riot police coming in to bash people. Huge conflict, and then in the classroom, the professors were saying, ‘All changes are marginal. Everything is in equilibrium.’ I couldn't take it seriously." About a year ago I reported on "The Economics of Horseshoe Crab Blood, referring to an article by Caren Chesler, "The Blood of the Horseshoe Crab" in Popular Mechanics (April 13, 2017). The subtitle of the story reads: "Horseshoe crab blood is an irreplaceable medical marvel—and so biomedical companies are bleeding 500,000 every year. Can this creature that's been around since the dinosaurs be saved?" Turns out that the blood of horseshoe crabs has some components that are superb at detecting infection. The blue-colored blood of horseshoe crabs was selling for $14,000 per quart, and the crabs were in danger of being wiped out in certain of their long-time habitats. "Contemporary humans do not deliberately kill the horseshoe crabs—as did previous centuries of farmers catching them for fertilizer or fishermen using them as bait. Instead, they scrub the crabs clean of barnacles, fold their hinged carapaces, and stick stainless steel needles into a soft, weak spot, in order to draw blood. Horseshoe crab blood runs blue and opaque, like antifreeze mixed with milk. ... Horseshoe-crab blood is exquisitely sensitive to toxins from bacteria. It is used to test for contamination during the manufacture of anything that might go inside the human body: every shot, every IV drip, and every implanted medical device. So reliant is the modern biomedical industry on this blood that the disappearance of horseshoe crabs would instantly cripple it." Jeak Ling Ding and her husband and research partner Bow Ho from the National University of Singapore started a quest to find an alternative. After a number of false starts over a couple of decades, they had identified the gene for "factor C," which is the key to detecting infection, and spliced it into "insect gut cells, turning them into little factories for the molecule. Insects and horseshoes have a shared evolutionary lineage: They’re both arthropods. And these cells worked marvelously." The scientific discovery was in the late 1990s, but the wheels of medical innovation can grind slowly. It took until 2003 for the first test kit to come out. But for a decade, there was only one supplier. Regulators like the Food and Drug administration seemed ambivalent about whether the new technology would be acceptable. Existing companies using horseshoe crab blood had no reason to switch. Pharmaceutical companies were risk-averse, too. It's not until the last few years that more suppliers have entered the market, and regulators and drug companies are opening up to the switch. In one of those ironic turns, medical technology first imperiled the horseshoe crab, but gene-splicing technology may end up saving it. Sometimes the answer to problems created by one technology is an alternative technology. estimates the effects of removing significant U.S. import restraints on each group. A typical annual household consumption basket would cost from $54 to $288 less each year if significant import restraints were removed, depending on the household group. Higher income groups benefit more than lower ones in dollar terms because they spend more; as a share of income, all income groups benefit by about the same percentage. on imports and competing U.S.-produced goods. In total, the gains typically outweigh the costs, although some households, sectors, and regions may be harmed." 1) By law, the mission of this report is that it can only look at restrictions on trade that are not the result of an case involving anti-dumping or a countervailing duty. The report notes: "As requested in the original letter by the USTR [US Trade Representative], this report considers all U.S. import restraints except those originating from antidumping or countervailing duty investigations, section 337 or 406 investigations, or section 301 actions." Thus, the report is required to leave out the recent steel and aluminum tariffs, and many other cases along similar lines. 2) The report is focused on the benefits of removing existing import restraints, and thus doesn't really look back on earlier gains. Import barriers around the world have dropped substantially in the last 25 years or so: "For example, the World Bank calculates that the applied weighted-mean tariff on all products for all countries with data fell from 34.0 percent in 1996 to 2.7 percent in 2010." Thus, the US economy has already been experiencing much larger gains from the reduction in trade barriers around the world. 3) The report doesn't include a quantitative estimate of benefits from reducing import barriers in service industries, which are increasingly important in the overall picture of US trade. Customs and Border Procedures on Global Supply Chains." 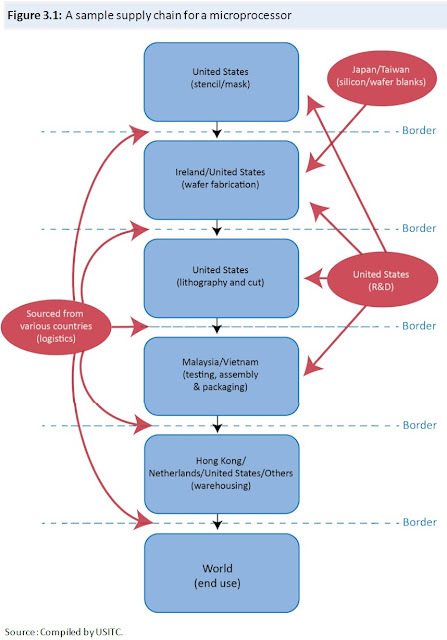 For an illustration, here's a sample of a supply chain for a microprocessor, which includes five border crossings and input from multiple countries. If one included the product in which the microprocessor is implanted, the supply chain would be even more complex. As the ITC report notes: "[S]since the 1970s, the use of foreign inputs in production has increased from about 15 percent of gross export value to between 25 and 30 percent. In recent years, more than half of global manufacturing imports, and 70 percent of services imports, are used as intermediate inputs in the production of other goods. Given this increased use of GSCs [global supply chains], the inefficiencies experienced between each stage of the supply chain have become increasingly important." Theft, bribes, and other forms of corruption. Again, none of these may be especially large in themselves, but taken together, when multiplied over a number of border crossings, the accumulate to something larger. Many of the recently proposed trade agreements are less about reducing tariffs, and more about addressing these processes and issues. 5) US industries are disrupted all the time by factors that don't much involve trade. For example, consider the textile and apparel industry, where the $2.4 billion in welfare gains is the single biggest source of gains discussed in this report. If one could sign a deal which said that the US consumers would pay more for clothing to assure that textile workers all keep their jobs, it wouldn't sound like the worst deal in the world. Except that even without trade, the textile industry wouldn't be standing still. The report discusses two big changes that affect textile and apparel, as well as lot of other industries: automation and innovation. Thus, here is the estimate of what would happen to the US textile industry with no change at all in the import restraints. fabric sectors are less price sensitive than imports of lower-cost commodity fabrics because technical and smart fabrics are produced through advanced manufacturing processes, after significant research and development, and therefore are not materially affected by the removal of import restraints. Further, one of the largest consumers of U.S.-produced technical textiles is the U.S. military, which by law must purchase its textiles from U.S. producers." US producers and their workers face all sorts of challenges, including domestic competitors, shifts in consumer preferences, new technologies, investment of the right size and type, evolving skills and training needed by worker, government taxes and regulations, and whether management can handle these challenges. Foreign trade matters, too, of course. But if we competed hard in tackling the rest of these issues, my suspicion is that foreign trade would look a lot less threatening.